Do you worry about the light so weak when you makeup,and want to add some lighting to your vanity mirror? Are you still install the light bulb on your vanity mirror,and the cable make your mirror look ugly? Are you worry about the 3M adhesive not stick enough? This led vanity mirror light strip will solve all the problem you worry about,this vanity light strip is a new idea design for your mirror,you can see more details about our product by the follow introduction. MULTIFUNCTION - 8MM wide, vanity lights is Invisible, a must home improvement For Mirror, 12V light bar for home DIY, illuminated make-up mirror, bathroom vanity lighting, TV or wall back ground light etc. BRIGHTNESS ADJUSTABLE -This hollywood style led vanity mirror lights is brightness enough, whit convenient dimmer which can fill your different brightness requirements.6000K colour temperature soft light. .CUTTABLE - 13ft flexible mirror lights are long enough for most mirror,can be cut after you finish installation, the extra strip can also be lighted up by its own female head, so you can install extra strip on other mirror. 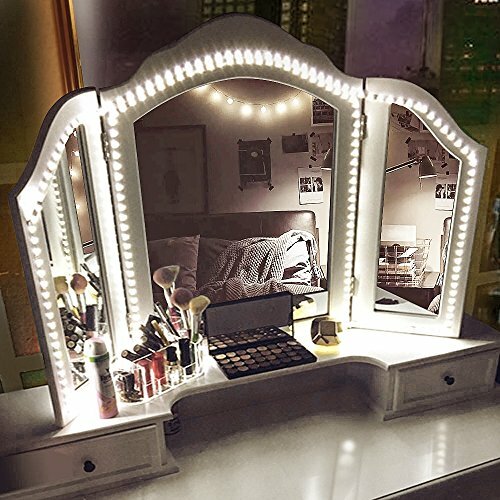 EASY TO INSTALL - The makeup mirror lights were equipped 3M strong adhesive behind, easy to install this vanity lights to your mirror or anywhere you want steadily. AFETY AND DURABLE - vanity light strips are lighted up with DC12V safe voltage which is safe to touch. Long life span more than 50,000 hours.Environmental protection and save your money. If you have any questions about this product by zizwe, contact us by completing and submitting the form below. If you are looking for a specif part number, please include it with your message.